A few weeks ago, I tasted some intriguing hummus at one of my favorite vegetarian restaurants, Eden Alley. 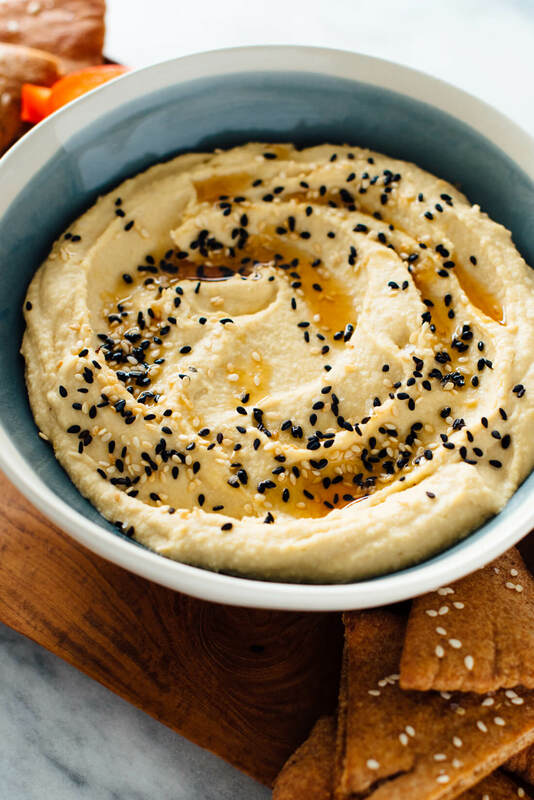 Hummus always has some sesame flavor thanks to the tahini component (tahini is ground sesame paste, like peanut butter made with sesame seeds). This hummus, however, had a more pronounced sesame flavor. I loved it. A few bites in, I realized their trick—they drizzled toasted sesame oil on top. Clever, right? I generally associate tahini with Mediterranean cuisine and toasted sesame oil with Southeast Asian cuisine, but they’re both made from sesame seeds. They go great together. I looked across the table and declared, “I’m going to make hummus with toasted sesame oil and sesame seeds and share it on the blog soon.” Boom! Here we are. You’ll start out by making ultra creamy hummus from scratch, with a little toasted sesame oil blended throughout. Freshly toasted sesame seeds and a drizzle of toasted sesame oil take it to the next level. Toasted sesame oil is very strongly flavored, so be sure to follow my suggested measurements rather than pouring straight from the bottle. 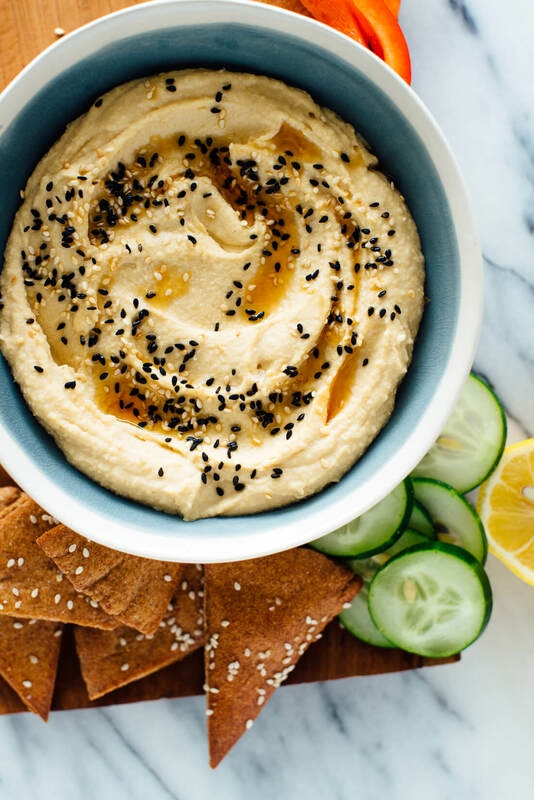 You could cheat and drizzle sesame oil and sprinkle sesame seeds over store-bought hummus (no judgment here). I brought this hummus over to my friend’s housewarming party last night and it was a hit. As always, please let me know how you like it! 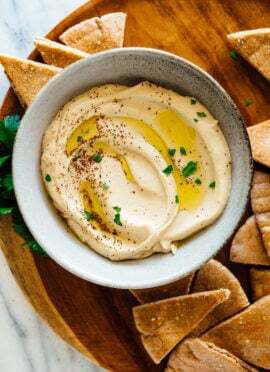 This creamy hummus recipe includes toasted sesame oil and toasted sesame seeds for incredible sesame flavor! It’s easy to make and so delicious. Recipe yields about 1 ¾ cup hummus. Suggested accompaniments: Toasted pita bread, carrot or bell pepper or celery sticks, crackers, etc. 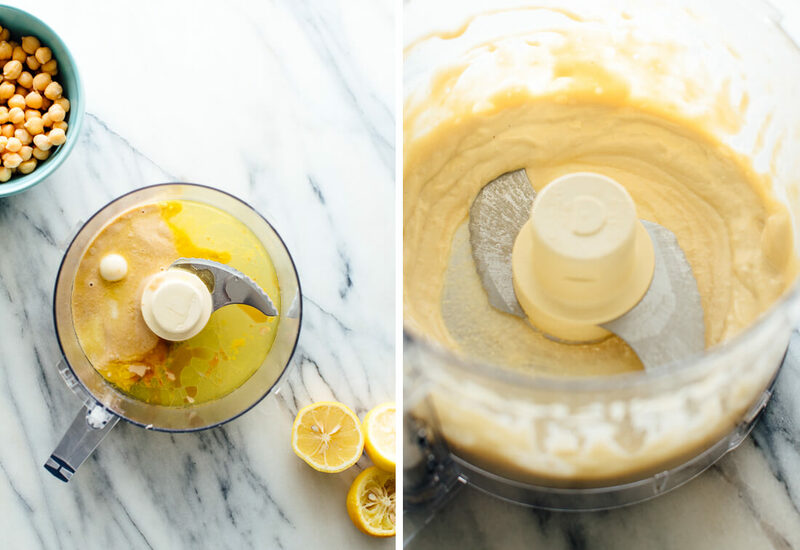 In a food processor or high-powered blender (i.e., Vitamix or Blendtec), combine the tahini, lemon juice, olive oil, garlic, salt, and ½ teaspoon of the sesame oil. Process for about 1 ½ minutes, pausing to scrape down the sides and bottom as necessary, until the mixture is smooth and creamy. 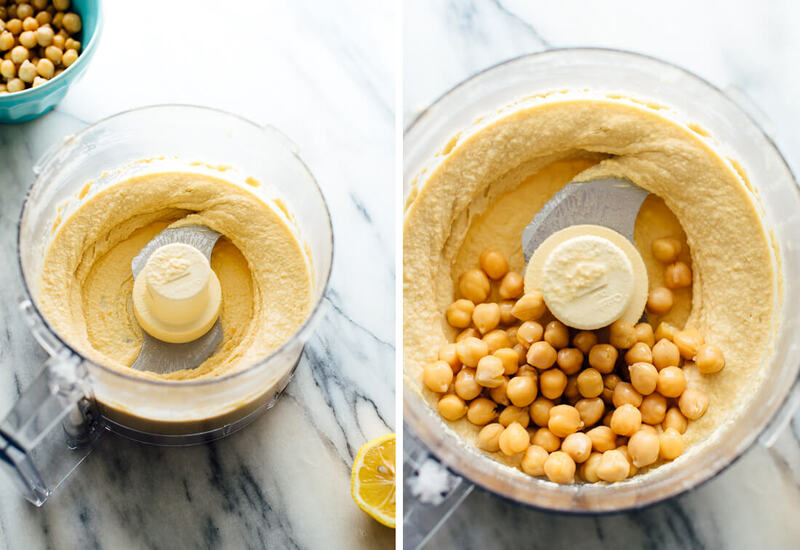 Add half of the chickpeas to the food processor and process for 1 minute. 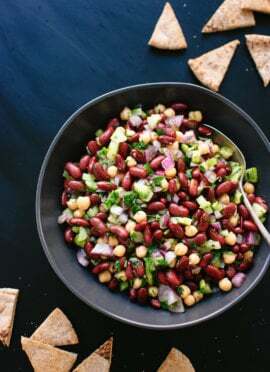 Scrape down the bowl, then add the remaining chickpeas and process until the hummus is thick and smooth, 1 to 2 more minutes. While running the food processor, drizzle in 2 to 4 tablespoons of water, until it reaches your desired consistency and level of creaminess. Taste and season with additional salt (I added ¼ teaspoon) and toasted sesame oil, if you want more pronounced sesame flavor (about ½ teaspoon). Set aside. Toast the sesame seeds in a small skillet over medium heat, shimmying the skillet frequently, until they’re starting to turn golden, about 2 to 4 minutes. Pour them into a bowl to prevent them from burning. Scrape the hummus into a small serving bowl. Lightly drizzle 1 teaspoon sesame oil over the top. Sprinkle generously with sesame seeds and a light sprinkle of flaky sea salt (if using). Serve with accompaniments of your choice. Leftover hummus keeps well, chilled, for 4 to 5 days. Recipe adapted from my green goddess hummus recipe, available online and in my cookbook. 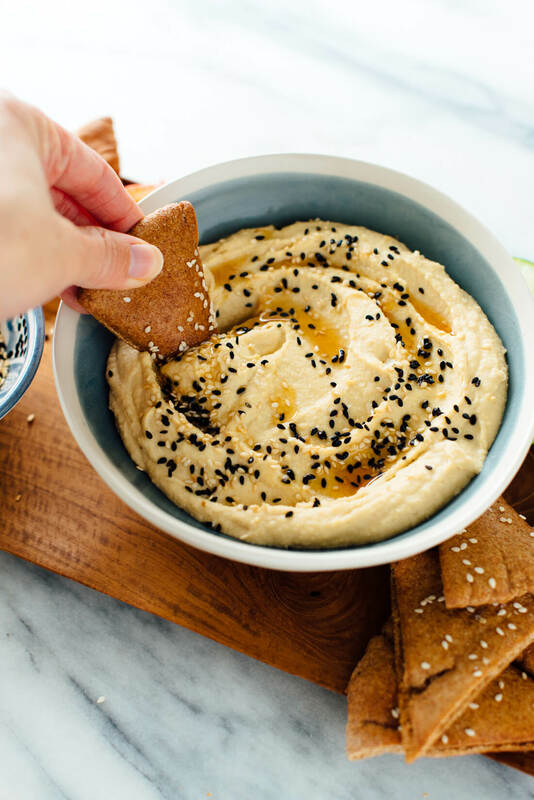 Change it up: If you omit the sesame oil and sesame seeds, you’ll have an ultra-creamy basic hummus recipe. 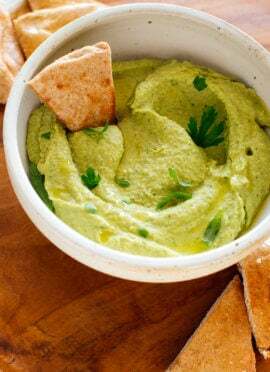 If you love this recipe: Check out these hummus recipes! The sesame oil on top sounds like a game changer!! Oooh, that looks good! On the docket for next week. I just made 2 c + k recipes today…always so delicious. Thank you, Danica! So glad you’re enjoying my recipes! Does your sesame oil smell nutty? If so, it’s toasted, and that’s the kind to use. If it’s neutral in flavor, it won’t do much for the hummus. What a brilliant and delicious sounding trick! I love the combination of ingredients from all different cuisines. I never would have thought to add toasted sesame oil, but now I can’t stop thinking about it! YUM! Thanks, Maria! I think you’ll get hooked on the toasted sesame oil/tahini combo if you give it a try, I know I did! Looks so yummy. Can’t wait to try it! OMG! I love this recipe. If you enjoy the taste (& smell) of sesame oil as much as I do, you’ll go ape over this. I now prefer this recipe to the traditional one I make – It’s on another level. Thanks Kate – you’ve outdone yourself with this one. Thank you, Jannette! I appreciate the compliment. I had the same realization about the tahini and toasted sesame oil connection. Your recipe came up right away and I’m glad it did! This was absolutely delicious and so easy. Thank you! I am happy you enjoyed it! Thanks so much for the review. Love me some hummus! This looks delicious. Nice a little spice! Thanks, Natalie for the review. 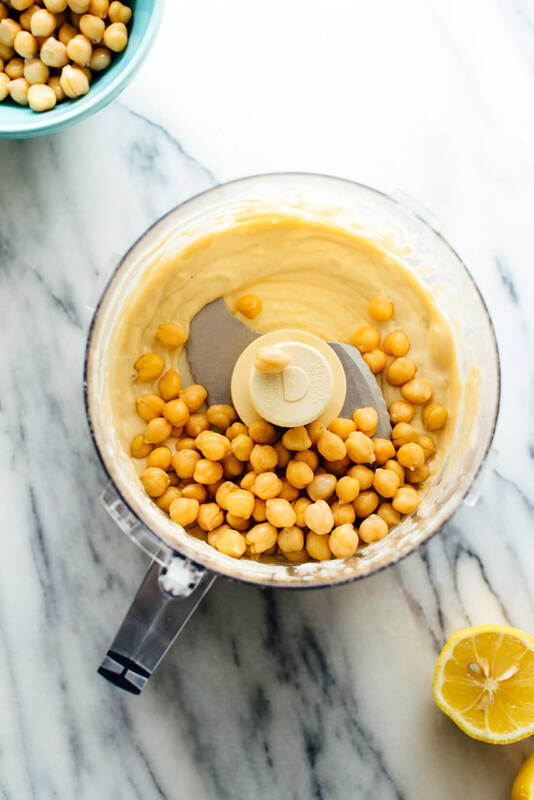 Just curious……why don’t you boil the canned chickpeas for 20 minutes or so in this recipe like you do for your other delicious hummus recipe? Hi Ali, good question. I figured out the boiling technique after I came up with this recipe. :) You can definitely do that if you’d like extra smooth hummus. I’m generally ok with skipping that step for flavored hummus like this, but it makes a world of difference for plain hummus. This is crazy good. And I am a hummus afficionado. Thank you so much for the inventive recipe. Oh my! This is so good! This recipe is definitely a keeper. Yum. Great to hear you think so, Liesl!